Stretching from the coast of British Columbia to uplands of Alberta, the subalpine forest region features cooler climate, a shorter growing season and longer winters. Avalanches play an important role in this forest’s diversity and disturbance. Characteristic tree species include lodgepole pine, Englemann spruce and alpine fir. Mammals such as pine marten, mountain caribou and American pika make use of habitats in this region. In 2003 the Nature Conservancy of Canada (NCC) protected Enchantment. 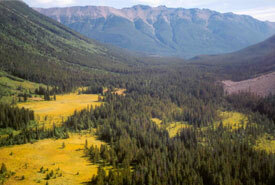 This 301-acre (122-hectare) property is located in the headwaters of the Ottarasko Creek in the Niut Range, near the southwest end of Tatlayoko Lake. The flat-bottomed valley provides excellent high-elevation habitat for old-growth forests. It also boasts wet meadow and fen ecosystems.